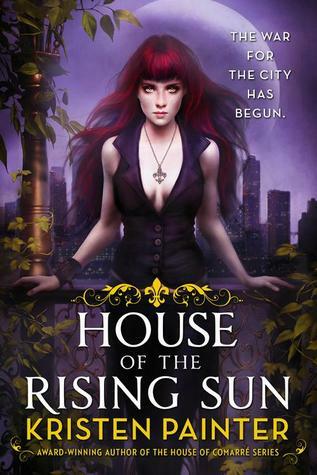 I borrowed an audio copy of Kristen Painter’s House of the Rising Sun through Hoopla. But when Augustine returns home to find Olivia’s been attacked by vampires, he knows his idyllic life has comes to an end. It’s time for revenge—and to take up the mantle of the city’s Guardian. Gah, this was not good. One Goodreads reviewer called it lazy and another called it facile and boring. Both are accurate descriptions of the book and describe my opinion perfectly. The author has some interesting ideas, but just drops them all in willy-nilly, with no attempt to situate them in any sort of world building. There is a semblance of plot. It has to be Augustine who protects the city, because reasons. Harlow hasn’t much spoken to her mother for decades, because reasons. She has to come home now, because reasons. Olivia has never told Harlow who her father is (despite it destroying their relationship), because reason. Olivia took Augustine in, because reasons. BUT NONE OF IT REALLY HOLDS UP TO THE LIGHT. And frankly a lot of it isn’t even believable. Lastly, the timeline is hinky. Ages aren’t ever stated, but they can be approximated with the information provided, and Olivia seems far too old to be Harlow’s mother. And all of Harlow’s childhood is basically glossed over with “sent to boarding school.” Despite this, there seems to be several missing years in there. And if 20+ years pass, am I to believe Olivia never mentioned essentially adopting a son? Again, it’s all a product of lazy writing. Edit: As an amusing side note, there is a character named Zarah in this book. She’s referenced, but never makes an appearance. This is noteworthy because just the other day I wrote a Goodreads review in which I said how rarely I see this name in books. Now, I’ve come across TWO IN A ROW. What’s the likelihood? I’ll cross-post the review to the blog when I finish the boxset and post all the reviews together. But at least I got a chuckle out of it. This entry was posted in books/book review and tagged audio book, book review, PNR, urban fantasy, vampires on March 11, 2019 by Zarah Robinson. I don’t usually review book that I don’t finish here on the blog. In the five years I’ve kept it, I don’t think I ever have. I post a note on Goodreads for myself and move on. But I have to have a little rant on about this one. Partly because I’m enraged and partly out of pure WTF confusion. Let me start by saying how much I hate (with a passion I’m not sure words alone can convey) coming across books like this. (And I’ve complained about this before). It’s book number 25 in one series, 10 in another, 5 in yet a third, 41 in another and the first in Dragon-Hunter: Dragon Rising. Apparently all these series intertwine. But can I read it as the first in ANY series, as that number 1 suggests? Or do I need to have read the others. What exactly, as a new Sherrilyn Kenyon reader, should I base that assessment on? Your guess is as good as mine. I picked the audio book up at the library and, despite serious misgivings, thought I’d give it a try. For the first half the book I was fine. I could feel that there was history I was missing. Characters probably had their own books, but I was able to follow the hero and heroine’s story. I had complaints, such as how fast it all moved and how magic with no defined limits side-stepped so many problems in too easy manner, but it was a readable PNR. And I appreciated that the heroine was a larger lady. Plus, it was funny at times. Then I reached disk 5, roughly the middle of the book. (There are 8 disks total.) Suddenly, and I do mean suddenly, despite having fallen in love in a day, ten years passed and then in a page or two the heroine was dead and centuries had passed for the hero. The story picks up with two totally new people. The original hero becomes a side character in their story and everything moves along as if the train hadn’t literally just changed tracks. I stopped the player to make sure a disk from another book didn’t get mixed in! It’s that abrupt and incongruent. So, to answer the initial question of can a book with multiple series listed be read alone, even if its called number one in one of those series, no. Half this book can be read as a first book in a series, but half is apparently the continuation of another’s story and can’t be read without all those previous books from multiple other series. That is my take away. I gave up. I didn’t finish disk five and I won’t be finishing the book. I’m left reeling and confused. What the hell just happened. What’s worse, in reading the reviews of other readers, this seems to just be rehashing other books in the other series (whichever it is). My advice is don’t bother. 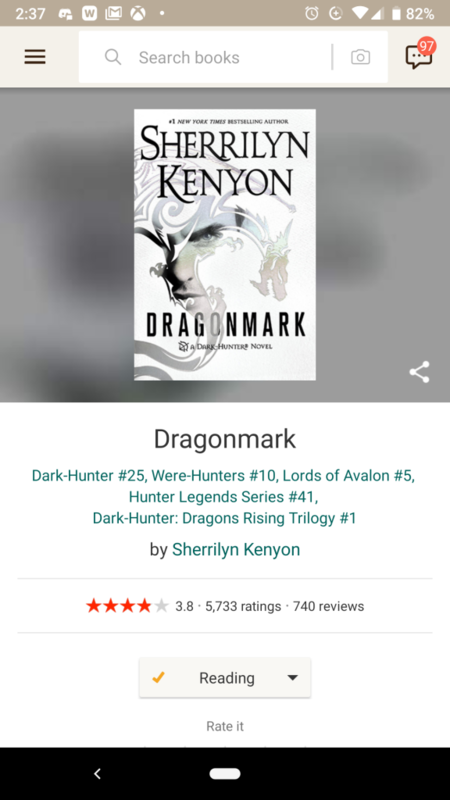 I’m going to stick to my initial instinct and steer very clear of Sherrilyn Kenyon’s books in the future. The foul taste left in my mouth from this one is that strong. This entry was posted in books/book review and tagged audio book, book review, DNF, Dragons, PNR on March 4, 2019 by Sadie. 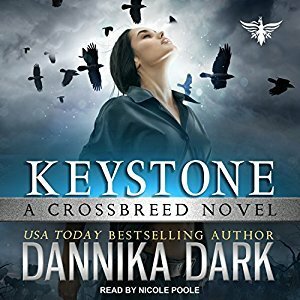 I borrowed an audio copy of Dannika Dark‘s Keystone through Hoopla. Raven Black hunts evildoers for fun, but her vigilante justice isn’t the only reason she’s hiding from the law. Half Vampire, half Mage, she’s spent years living as a rogue to stay alive. When a Russian Shifter offers her a job in his covert organization hunting outlaws, dignity and a respectable career are finally within her grasp. The catch? Her new partner is Christian Poe – a smug, handsome Vampire whom she’d rather stake than go on a stakeout with. They’re hot on the trail of a human killer who will stop at nothing to get what he wants. One misstep during her probationary period could jeopardize Raven’s chance at redemption, and her partner would love nothing more than to see her fail. Will Raven find the courage to succeed, or will she give in to her dark nature? This pretty seriously didn’t work for me. I thought the mechanical writing was fine, but I thought Raven didn’t live up to her hype. She’s said to be some special killer, but she doesn’t win a single on-page fight, has to be rescued repeatedly, and even says she can’t fight well. How did she kill so many bad guys? She flirted and tempted them into alleys and bathrooms to surprise them with her crossbreed status. Really? That’s it? No thank you. Additionally, Raven ran off and had more than one too-stupid-to-live and I thought the main male character was just a jerk. All of his sexual innuendo got old and felt like the author trying too hard to be clever. Crossbreeds aren’t supposed to exist and how she does is never addressed. And I didn’t really believe people would put the trust in her the way they did. All in all, I didn’t like it all that much. What’s more, I thought Nicole Poole’s narration was inconsistent. The actual narrative parts were fine, but the accents sometimes made me cringe. This entry was posted in books/book review and tagged audio book, book review, PNR, urban fantasy on February 21, 2019 by Sadie.